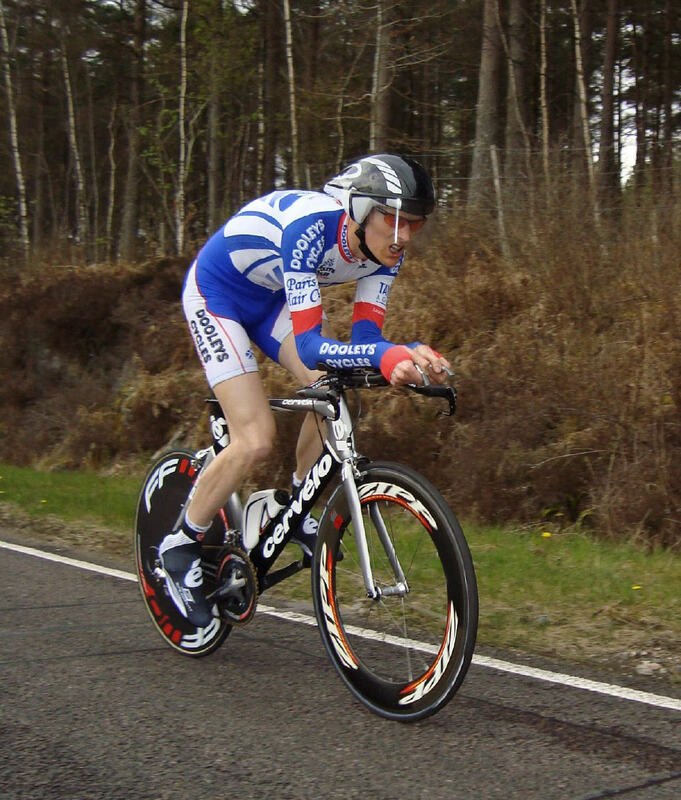 On a lovely sunny afternoon, Arthur Doyle (Dooleys Cycles) rocketed around the Scottish Championship 10 mile course at Corpach outside Fort William to take the gold medal for the third year in a row. Arthur also won the fabulous Jason MacIntyre Memorial Trophy, awarded in memory of Jason who was tragically killed just over two years ago and who was the winner of ‘the 10’ himself four years back. Second, 33 seconds back, was Shetland Wheeler Carlos Riise, and Alistair Robinson (Leslie Bike Shop) only three seconds further adrift in the bronze medal position. The three riders were all in the last four to be sent off by the timekeeper, and proving the organiser’s seeding was pretty accurate, the fourth rider in the race, Gary Robson (Peebles CC) was also in the last four away, winning fastest Vet for his efforts. Gary actually tied with Evan Oliphant but felt he should get allocated fourth on account of being a vet! The trophy, designed by Jason’s wife Caroline features a black granite tear-drop, representing Jason’s aero-helmet, with the marble base infused on the sides with stone chips like the roads Jason won on, and on the top with twinkling stars – as Caroline said when she was presenting the trophy and looking at her two wee girls, “where we know he is now“. I got delayed in the office, Gillian was laid low with a stomach virus and was better off staying in bed, and so it was later than planned when I met up with Caroline, Gary, Shona and Nik for a bite to eat in a hotel in the highland town. I was all for being good, and carbo-loading, until Caroline and Gary insisted that Jason would have had the fish and chips here the night before a race, and as they were, so I did too – and it was too nice to care about saturated whatnots! Too late for a course recce by now, it was back to the digs and, thanks to the 12:30pm start today, a lie-in – magic! 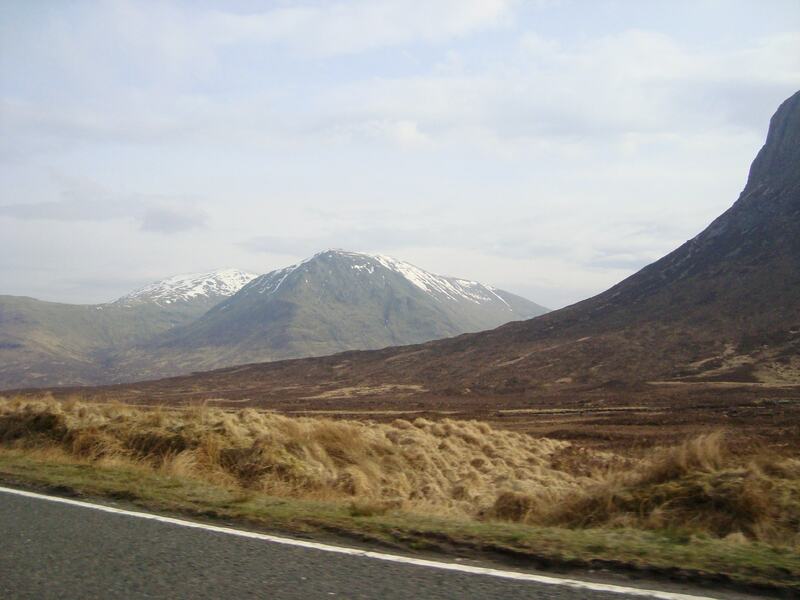 I was still up in enough time this morning to have a great breakfast and ride into Fort William and out the other side, to suss out the course conditions and try to plan my race. Meeting up with Gary later, we got all our kit sorted in final prep: discs and deep rims polished, tyres cleaned with vinegar, etc., and then we were off. Gary was off second last, and had a bit of time to kill, which he did chewing the fat with Endura Racing’s Davy Lines, discussing their van conversions and the next aspect they could pimp-up. Hope it wasn’t those deep discussions which made Davy miss his start! I warmed up on the turbo and pottered off to the start. The race was superbly well organised, great marshalls, and naturally, there was a marked level of safety-consciousness, although the course didn’t have many vehicles on it and was pretty straightforward : along the north shore of Loch Eil to the turn in the road, and back past the start for half a mile to finish. Main factors were the rising temperature – which was pleasant to stand around chatting in, but meant that the wind also got up for the second half of the field, and the undulating profile of the road. It certainly isn’t a flat motorway of a course, with several pretty sticky rises to contend with in each direction. Once finished, I got changed and to unwind the legs a little, rode back out on the course to watch the fastmen on the way back. Evan Oliphant finished fourth equal, but would almost certainly been faster had he done without a trip onto the verge, courtesy of a badly driven car trying to overtake in an impossible place. Evan took the car’s nearside wing mirror out with his arm, and wrecked his new Endura oversock on the bushes at the roadside. Mind and put that into your team logbook mate. “It’s difficult just now, I work away so much that it’s hard to get consistent training in. I’m off to Ireland next week for example, without a bike. I used to swim and I’m going to get back into that a bit – at least I’ll get my heart rate up and lungs working in the hotel pool when I’m away”. 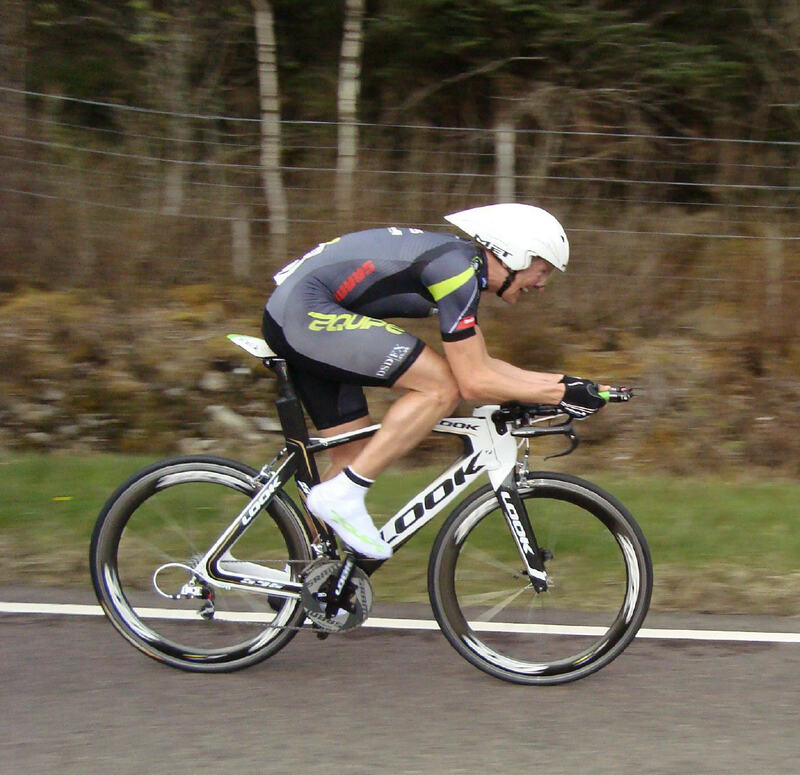 “Unless you’re Chris Hoy, you never try as hard in training as you do in a race. 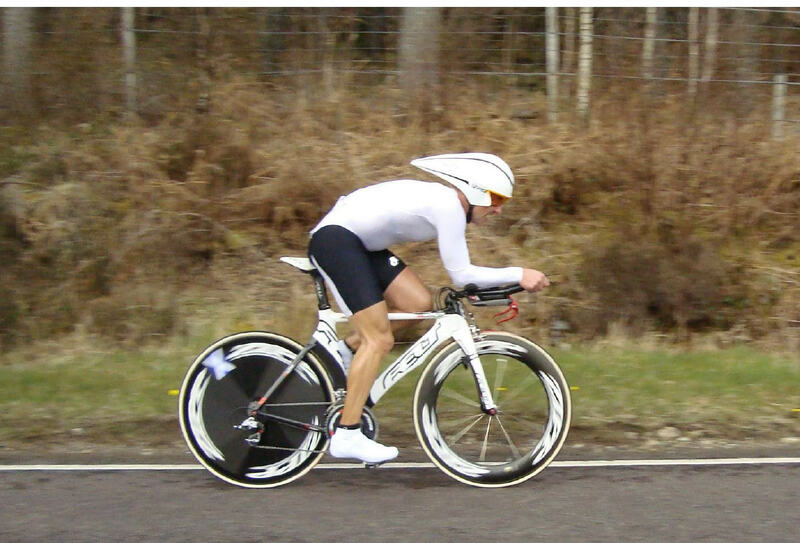 With a number on your back, you put in a much higher quality session, and these tests will help me in my road racing; closing gaps, sitting tempo for a teammate, or maybe even defending a jersey in a stage race time trial, like Alex had to do at Murcia”. Carlos Riise was the next rider we were expecting, and just on cue he appeared in the distance, sweeping past us in his familar low tuck, shoulders still and pedalling a big gear. 10 miles or 100 miles, always consistent and always fast. Alistair Robinson came into view, moving smoothly with quite a high cadence. Shona thought she’d made a mistake; “he’s exactly the same time as Carlos“. Just two riders to go. Gary Robson has been having problems recently with nerves in his back and hamstring, “it’s like my leg has a mind of it’s own!“, and was not exactly comfortable having the reigning champion starting directly behind him – albeit, at two minute intervals for the last dozen riders, a catch by Arthur was never on. “I’m not really on for this today, I’ve missed too much quality training in the lead-up, but I’ve bought all this new kit and I’m really looking forward to using it”. Gary fired past us with a determined look on his face, riding on heart as much as fitness, and ended up 20 seconds off the podium steps. Only Arthur Doyle to see now. there was a gasp as he appeared a minute sooner than we thought he would – absolutely flying. Churning a massive gear, but as steady as a rock, Arturo resembled an industrial machine, those long thin legs somehow able to keep the pressure up onto the 56t chainring and the power ‘at the back wheel’, as those MotoGP guys say. Very impressive. “To get under 20 minutes, I’ve never done a 19′ and that’s my motivation. No, I’m not riding a huge commute these days, it’s down to about 40 miles over some great roads, and if I leave early enough and miss the traffic, it’s lovely. Back at Race HQ, a great spread was enjoyed by all. Caroline directed me to the best fairy cakes (her mum’s), and presented all the prizes to the winners. We thought a nice way to finish our day would be to pop up the hill near the HQ, and say hello to Jason. 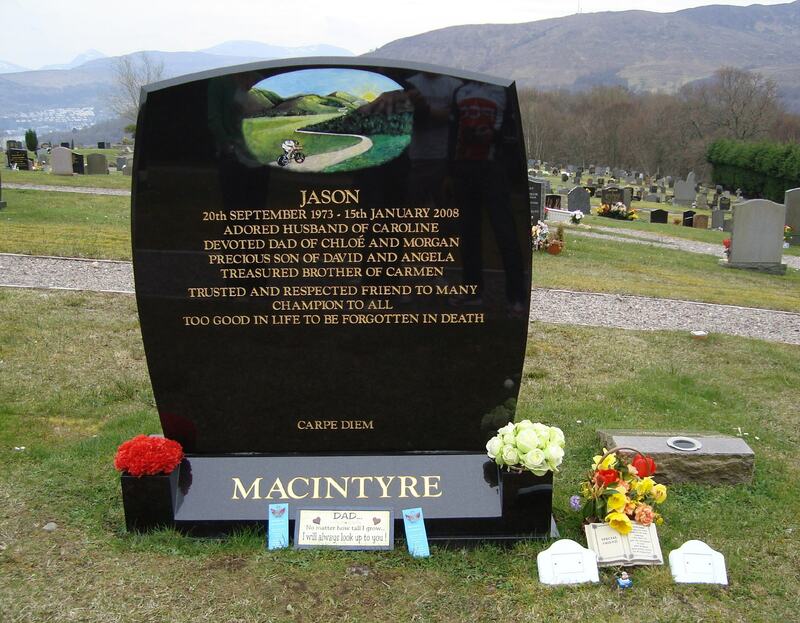 His stone is wonderful, perfect in every aspect, with a beautifully etched drawing of Jason climbing a local hill in his British Champion’s jersey. Imposing, large and powerful, just like the man himself. We reckon Jason would be pleased with the day’s racing, and happy that the trophy went to a very deserving winner. Top three in the men’s championship.